The society have been founded in 1997 by five main founders : Robert Smith, Loui-Philippe Coiteux, Suzanne Piché, Pierre Lalonde et Pierre Hétu. Because the head office is located at the nursery Bonsaï Gros-Bec in Lanaudière and also because it was a small society regrouping people of the region in most case, they decide on calling it “SBPL”, the Société de Bonsaï et de Penjing de Lanaudière. The first official meeting took place on february 1st, 1998 and was chaired by the 1st president, Pierre Lalonde. Several Presidents will set raise it, Robert Smith in 1998, Pierre Lalonde in 2000, Louis-Philippe Coiteux in 2002, Jean-Guy Arpin in 2006 and finally Michel Duchesneau in 2007. Here is a photo of the first board of directors, on 1998. The first member in rule of the society is madam Louise Pelletier, we still have the pleasure of having her as an active member. 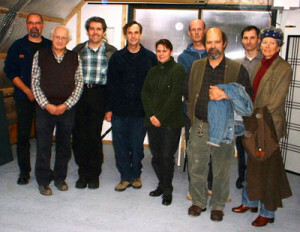 It is in 1999, that the first exhibition is organized, at this moment the society counted only 30 members! We can admire the promotional poster of the first exhibition to have taken place to Repentigny. The exhibitions took place at Repentigny then, moves to Joliette for the 2002 and 2003 editions. In 2004, the exhibition took place for the first time at the Bonsaï Gros-Bec nursery and did not change place since this time! The society goes with more members every year to the point of exceeding the cape of the 100 official members. In 2008, certain debate within the board opens the door for a change in the name of the society. In effect, the reality of the society by its “national” membership and its wish to continue advancing does not fit any more with the very local appelation of “Lanaudière”. 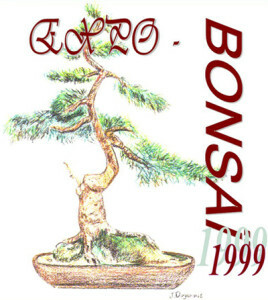 During an assembly where the members were invited, we voted in the unanimity of re-name the society as SBPQ, the Société de Bonsaï et de Penjing du Québec. A new name, but always the persons with even purpose and the same passion! In summer 2009, after several months of planning and intense job, the society finally reveals the new Website so waited by its members! 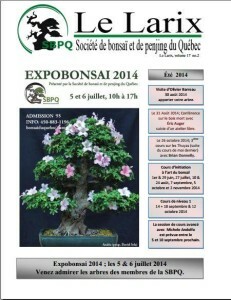 Now, we count more than 200 members and we always pursue our mission to make the promotion of the bonsai in Quebec. The whole, in an atmosphere of the happiest!